The Global Volcanism Program has no activity reports for Methana. The Global Volcanism Program has no Weekly Reports available for Methana. The Global Volcanism Program has no Bulletin Reports available for Methana. 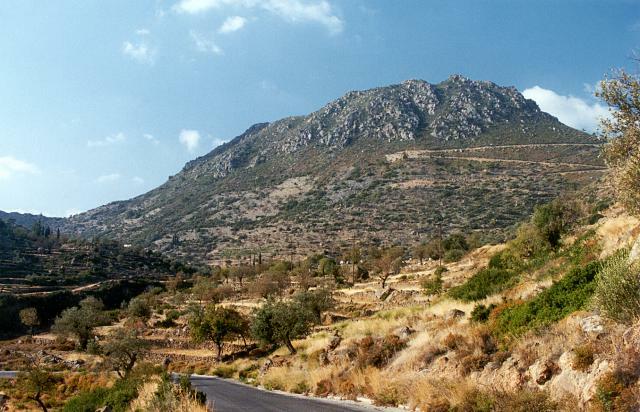 Methana volcano consists of a basaltic-andesite to rhyodacitic lava dome complex forming the Methana Peninsula in the Sarronian Gulf on the NE side of Peloponnesus. Potassium-Argon ages for the older part of the complex range from 900,000 to 550,000 years, although activity may have begun during the late Pliocene. A younger phase of activity took place from about 380,000-290,000 years ago, forming a series of lava domes and flows. The youngest dome, Kameno Vouno, on the NW side of the peninsula, was formed in the 3rd century BCE and produced a lava flow that traveled 500 m beyond the coastline. Hot springs are found at several locations along the coast of the peninsula. D'Alessandro W, Brusca L, Kyriakopoulos K, Michas G, Papadakis G, 2008. Methana, the westernmost active volcanic system of the south Aegean arc (Greece): insight from fluids geochemistry. J. Volcanol. Geotherm. Res., 178: 818-828. There is no Deformation History data available for Methana. There is no Emissions History data available for Methana. Malja Khoriou lava dome, seen here from the SE, lies on the eastern side of the Methana Peninsula and is one of several basaltic-andesite to rhyodacitic lava domes forming the Methana volcanic complex. The peninsula extends into the Sarronian Gulf on the NE side of the Peloponnesus Peninsula. The youngest dome, Kameno Vouno, on the NW side of Methana Peninsula, was formed in the 3rd century BCE and produced a lava flow that traveled 500 m beyond the coastline. Large Eruptions of Methana Information about large Quaternary eruptions (VEI >= 4) is cataloged in the Large Magnitude Explosive Volcanic Eruptions (LaMEVE) database of the Volcano Global Risk Identification and Analysis Project (VOGRIPA).